Simple. Sustainable. Good. 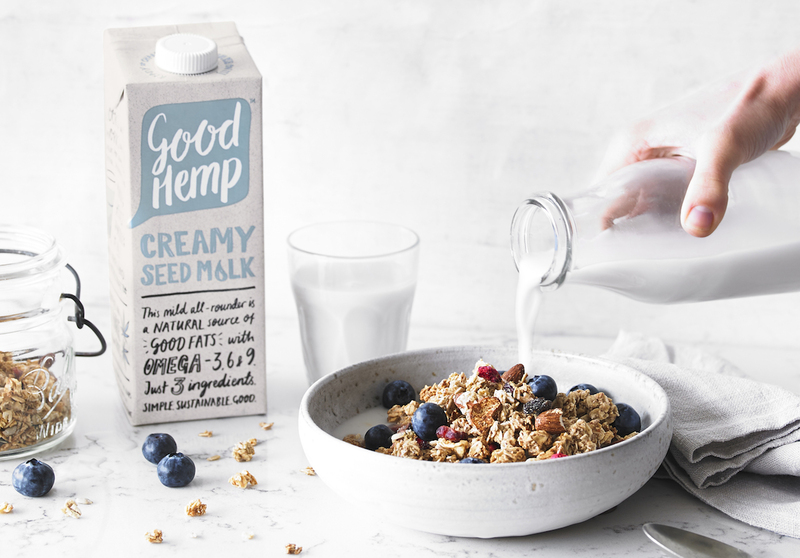 Those are the three principles we had in mind when we created the recipe for our new dairy-free Good Hemp Creamy Seed Milk – made from one of the most eco-friendly plants on the planet, a natural source of good fats (with Omega 3, 6 and 9) and now with just three ingredients. Here at Good Hemp, we’re on a mission to replace bad with good. That means no more animal emissions, no more deforestation (sorry soya), no more unhealthy stuff and no more poor substitutes. In short, we want everyone to switch their plant-based dairy free milk to hemp. But before we got the world to change, we knew we had to make some changes first. That’s why 7 years on from our first hemp milk, our founders used the same innovative spirit that got us here in the first place to create the most natural hemp milk recipe possible, with the creamiest flavour. Just hemp, water and a 100% natural, sustainable gellan gum to hold everything together. We’re confident that with this all-natural recipe, the world will get behind our mission to get hemp in every household. And why wouldn’t you? Hemp milk is a stellar source of good fats – great for brain, skin and heart health – and the only dairy alternative that’s a good source of omega (not even dairy can claim that). Our eco-credentials aren’t bad either: hemp happens to be one of the most sustainable plants on the planet and breathes in four times more CO2 than trees. And last but definitely not least, our creamy hemp milk is versatile. This mild all-rounder has a light and nutty flavour (a bit like a cross between a sunflower seed and a pine nut) which makes it great for breakfast porridge, cereal and splashing in tea. Oh, and it takes the “green smoothie” to a whole other level. Need more convincing? We’ll break it down for you here. For the past year, we’ve been creating a new recipe for our hemp milk which was as natural and close to the hemp seed as humanly possible (which means we also no longer fortify our milks with vitamin D or calcium). We’ve stripped down our ingredient list to just a hemp seed base, water, and a natural gellan gum (which helps keep everything bound together). All our ingredients are sustainable and plant-based, and there are no preservatives or added sugar. We like to call our creamy hemp milk a mild all-rounder, with a light and nutty taste (that could be described as the cross between a pine nut and a sunflower seed.) How to use it? The possibilities are endless – but if we had to start somewhere that place would be the breakfast table (because isn’t that where all good days begin?) It’s perfect for a creamy, dairy-free porridge, overnight oats to save the morning rush, or pouring over your favourite cereal (we suggest trying our homemade granola with hemp seeds). Splash into your morning tea or favourite smoothie recipe (this peanut butter concoction is a dream). The more adventurous will cook it into their baked goods or blend it into soups. Whatever your taste, there’s a way to make our dairy-free hemp drink work for you. Once you’ve given it a whirl, share your recipes with us. Hemp seeds are the base of our creamy hemp milk which means it’s naturally packed with Omegas 3, 6 and 9 which we all know are important for a healthy heart, good skin and brain function. Most people get their omegas from oily fish, but one glass of Good Hemp has twice as much Omega-3 as a tuna steak, making it one of the most effective sources of plant-based omega there is! Anyone for any more? Our dairy-free hemp drink is low in saturated fats and free from cholesterol. There are no added sugars or preservatives and it’s totally allergen-free (that’s no dairy, no nuts, no soya). Don’t you think your breakfast would taste better if it was good for the planet too? Hemp’s sustainability creds are second to none. The plant grows in just four months from planting and does not need any pesticides, herbicides or fertilisers. In fact it barely even requires water as it has the miraculous ability to irrigate itself naturally (this is a massive bonus for people who want to move away from crops like soya or almond which are very thirsty indeed). As hemp grows, residual leaf matter falls to the ground to regenerate the soil. All this happens while the plant is breathing in enough CO2 to make it basically carbon neutral. Phew. Hemp’s environmental profile doesn’t stop there though. Once it’s harvested nothing goes to waste: the seed is used to produce healthy food products, the flowers and leaves to make beauty products and CBD, the stalk for natural fibre. We’re often asked about the eco profiles of our packaging and the answer is that they’re the most friendly options available to us at the moment. Tetra Pak® cartons are principally made from a renewable resource (wood) but they are tricky to recycle (as most councils don’t separate the plastic and carton). As for the plastic bottles, they are the most recycled form of plastic bottle in Europe. Bioplastics aren’t available for our product currently, but as soon as they are…we’ll be the first to jump on board. To discover more about hemp’s environment benefits, why not read more on it here.